By buying this product you'll earn up to 2110 Rewards points. 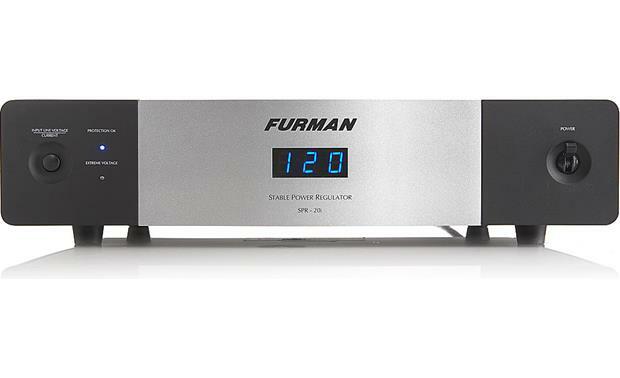 If you have a heavy-duty 20-amp circuit powering your audio/video system, Furman's SPR-20i prevents unstable AC power from holding back its performance. It also guards against harmful power spikes and surges, and filters out the noise riding along on your home's electrical wiring. Never heard of Furman? Most studio engineers have. 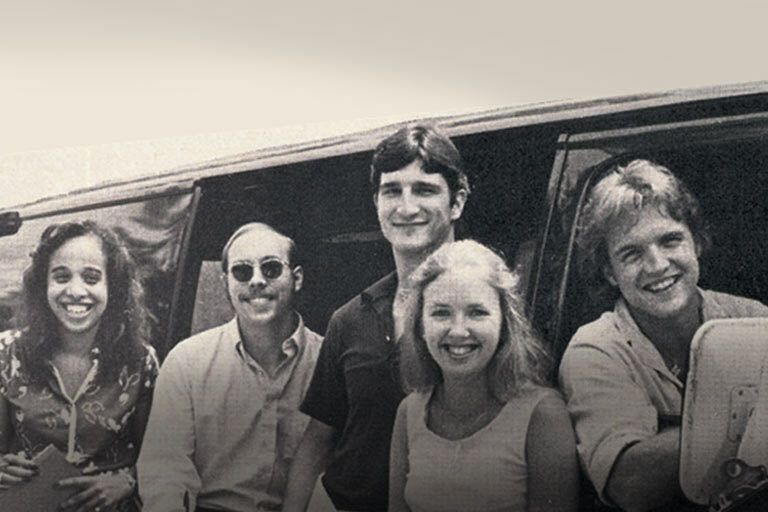 The company's spent over 30 years meeting the extreme AC power demands of professional recording, film, and broadcast studios. The SPR20i's outlets accept both 20-amp and standard 15-amp AC plugs. Its power cord must be plugged into a 20-amp receptacle. As heavier and heavier demands are placed on the nation's aging power grid, inconsistencies in the quantity and quality of every home's AC power will only get worse. These fluctuations may not affect your refrigerator or dishwasher, but they can cause problems for the delicate circuitry in audio/video equipment, shortening your gear's lifespan and degrading both picture and sound quality. The SPR20i maintains an unwavering 120 volts — you can check it on the front-panel display. And unlike most voltage regulators, this one is designed to work with heavy-duty 20-amp circuits. The SPR20i's wide-bandwidth filtering cuts way down on the AC "line noise" that can mask subtle ambient sounds and fine picture detail. 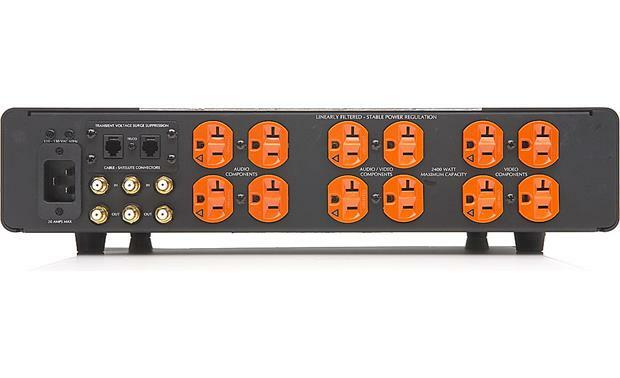 Twelve AC outlets on the back panel are divided into three banks, to isolate your system's digital and video circuits from analog components and amplifiers. This helps prevent noise created by one component from affecting the power going to your other plugged-in equipment. These outlets will work with 20-amp or standard 15-amp AC plugs, and they've got hospital-grade connectors that grip your gear's plugs securely. This unit is the best yet. We install this equipment in limousines running a Crestron system in front of a suite of AV equipment. In this "challenging" environment, the SPR20i is the first unit to perform flawlessly. Stable Power: The SPR-20i's exclusive Stable Power AC Voltage Regulation Technology maintains 120 volt AC output with higher and lower voltage inputs, allowing power amplifiers and powered subwoofers to perform at their full potential. Using the SPR-20i, your home theater is supplied with constant, virtually unwavering AC voltage. 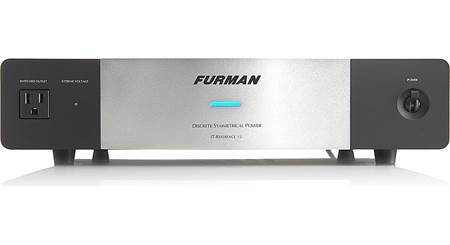 Fuman's zero-crossing solid state technology provides 60 amps peak current, avoiding the current limiting found in AC regulators that convert AC power into DC, then synthesize an AC output signal. EMI and RFI Filtration: EMI and RFI noise entering your A/V system through the AC power line couples to the components and masks low level signals, compromising performance. This low level content is critical because it relays the harmonics and ambience in audio, and the depth and clarity in video. Furman's exclusive Linear Filtering Technology dramatically reduces noise, ensuring consistent peak operation regardless of load conditions or the time of day. Series Multi-Stage Protection (SMP): SMP is maintenance-free surge suppression, offering AC protection without sacrificing itself in the event of a catastrophic surge. The SMP circuit senses voltages so high that operation is impossible and turns the power off before damage can occur; if the voltage exceeds 140 volts power is removed from all the outlets and the Extreme Voltage LED lights. EVS: The Extreme Voltage Shutdown (EVS) circuitry constantly monitors the line voltage for unsafe over-voltage conditions. When an extreme voltage is recognized all 12 outlets are automatically disconnected to protect your equipment. Once the line voltage returns to normal the outlets are reconnected. Video Bank: The video bank has four outlets. In addition to the linear filter, an ultrasonic filter specifically benefits video components (DVR, DVD player, projector, Plasma and LCD TVs, etc). Audio/Video Bank: The audio/video bank has four outlets, EMI and RFI noise is removed by the linear filter. Audio Bank: The audio bank has four outlets, EMI and RFI noise is removed by the linear filter. Transient Voltage Surge Protection: The SPR-20i features transient voltage surge suppression for standard telephone lines, coaxial cable TV lines, and coaxial satellite lines. There is one pair of phone input/output jacks and three pair of coaxial input/output jacks. The coax jacks are bi-directional and pass both DC carrier signals and high bandwidth HD signals with an insertion loss of less than 0.1 dB. 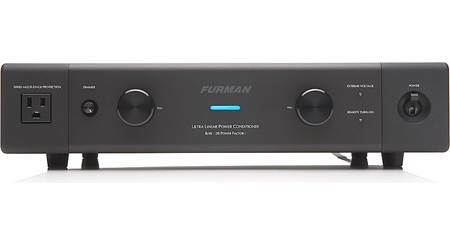 All the in-line surge suppressors feature Furman's exclusive Zero Ground Contamination technology; this aids in eliminating audio buzzing and the video hum bars that can result from typical in-line suppressors. Rack Mount: Brackets are included to rack mount the SPR-20i. NEMA 5-20P: The included power cord has a NEMA 5-20P plug (three-prong with one of the blades turned 90°), so it requires a 20-amp NEMA 5-20R receptacle. 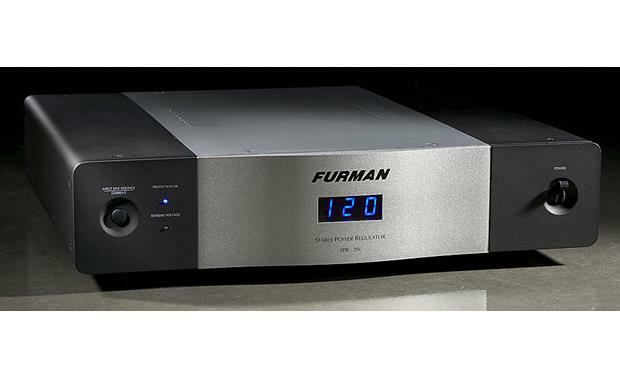 Connected Equipment: Furman Sound's Connected Equipment Warranty covers equipment that is damaged by a transient voltage while properly connected through the Furman SPR-20i to a properly wired AC power line with a protective ground in an indoor location. 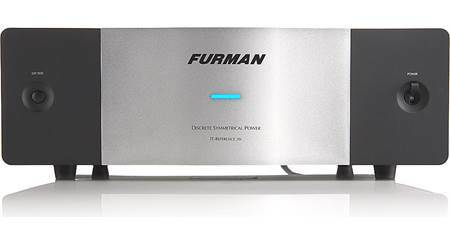 Furman's Connected Equipment Warranty is limited to the amount of the deductible on the Purchaser's personal property insurance policy, up to $500.00. The Connected Equipment Warranty is in effect for a period of five years. 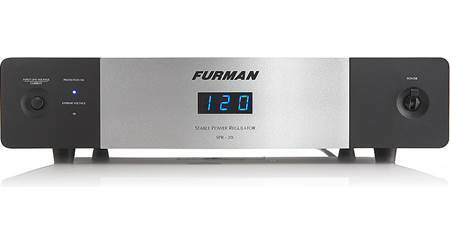 Searches related to the Furman SPR20i 20-amp power line conditioner, surge protector, and voltage regulator.